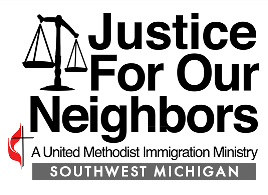 Members of Kalamazoo First UMC have met folks who daily live with the fear of deportation, some of whom may have a legal basis for remaining in this country. Often these are people are the primary breadwinner, or much-loved caregiver. The 2010 census showed Kalamazoo County had over 12,000 immigrant residents, many of whom need legal services in order to navigate the arcane rules and regulations of our immigration system. JFON is a ministry of hospitality that welcomes immigrants into our communities by providing affordable, high-quality immigration legal services, engaging in advocacy for immigrants’ rights and offering education to communities of faith and the public. JFON-Kalamazoo is a self-supporting satellite of JFON-West Michigan, which over a 10-year period has helped more than 1,200 immigrants from 60 countries. Other satellite clinics operate in Holland and Traverse City. Monetary donations are accepted at any time online. If you need legal immigration assistance, please call the JFON office at (269) 743-2501 for an appointment. You can leave a message at any time of day (in English or Spanish), and someone will get back to you. Para ayuda, por favor llame la oficina, (269) 743-2501, para hacer una cita. Puede dejar un mensaje en cualquier momento del día (en español o inglés), y alguien le responderá. Welcome Center, by contacting Ann Sweany at a.sweany@jfonwestmichigan.org.or completing the online order form. Books are $10 each. For more information about the book and to hear an interview by WMUK's Zinta Aistars with Miriam Downey and Jennifer Clark, follow this link: http://wmuk.org/post/between-lines-meeting-immigrant-neighbors.